I hear it all the time: “How hard is it to get in a car and just shoot an awesome video?” That’s because the very best car videos make it look easy, like someone hopped in some amazing machine and went drifting all day long—simple as that. 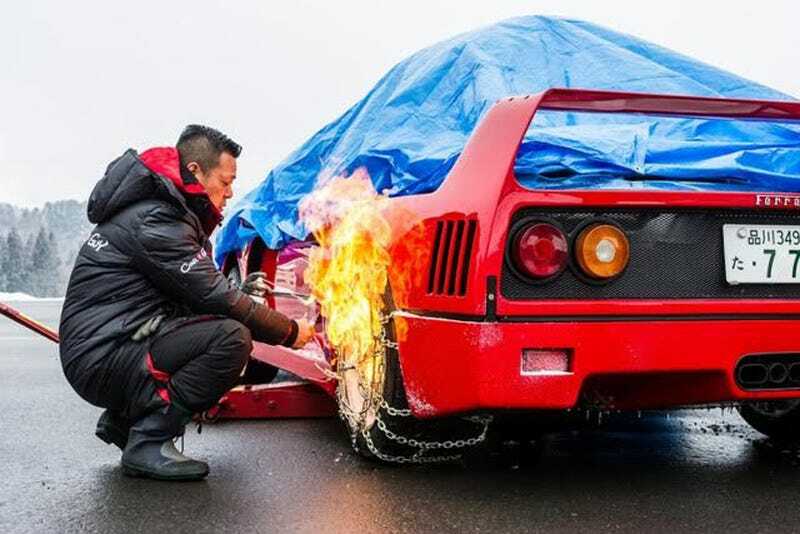 But video shoots are incredibly complicated, time-consuming efforts, and that amazing Red Bull Ferrari F40 snow drift shoot was no different. We showed you that video and some gorgeous behind-the-scenes photos of how it was made in Japan. Now the full story comes out from Red Bull, and it turns out—and this should not be surprising when you stop to think about it—that shooting a video in snow with a nearly 30-year-old supercar is far from easy. The F40 alone was tough to work with. The battery kept dying because of the cold, the front struts gave out, and after the reverse gear blew up, they could only move it forward the entire shoot. Plus, they had to shoot the car getting sideways through the snow with manual focus at times, and that meant going without gloves. There were also changing weather conditions, towing a $2 million exotic around and beating on it hard doing filming, trying not to crash into trees and snow banks, and getting only one take per location. No re-shoots here. You can’t argue with the finished product, or the nearly 1.5 million views it’s gotten on YouTube. It may look like something from a car nerd’s fever dream, but it was a dream that took a ton of work to make happen. I’m happy to volunteer to help with the next one. I’ll bring my coat.